Please have your student wear a white uniform shirt Friday for a photo prior to the Good Friday Service - Friday, April 19th at 1:30 at the church, hosted by 7th grade. Enrollment for 2019-2020 school year is now open. St. Augustin Catholic School provides a program of academics and experiences in a Catholic environment while offering academics that are top notch. Our Des Moines Catholic school provides a warm, caring environment where students are challenged every day to learn the essential curriculum, as well as the value of human dignity and the concepts of peace. Our dedicated St. Augustin teachers and staff have educated students in their faith and academics since 1926. 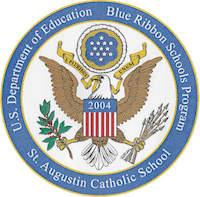 The U.S. Department of Education named St. Augustin Catholic School a Blue Ribbon School in 2004. The Blue Ribbon Schools Program honors public and private K-12 schools that are academically superior in the nation. We are proud of our tradition of academic excellence in our Des Moines private school, but also proud of our students’ dedication to serving the community. 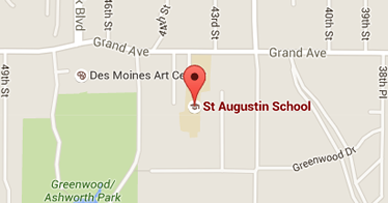 St. Augustin students donate to local charities and perform service hours in the Des Moines area. Each month our school has an out-of-uniform day where each student brings $1.00, which is donated to our Mission of the Month. Proceeds go to Catholic missions around the Des Moines metro, the United States and the world. Other efforts performed by our Des Moines private school students and parents include an annual school supplies drive for Terra Livre in Brazil, meal prep for Meals of the Heartland, supplying breakfast casseroles and blessings bags for the Salvation Army and preparing and sharing a meal at the St. Joseph Family Shelter in Des Moines. We have the opportunity to bring God into our classrooms, extracurricular activities and athletics as part of the Diocese of Des Moines. Here at St. Augustin Catholic School, young people can live their values in a supportive Catholic environment. Please read for important information and updates. Saint Augustin Parish is pleased to announce Ms. Kristel Kautzky as the new school principal beginning July 1, 2019.